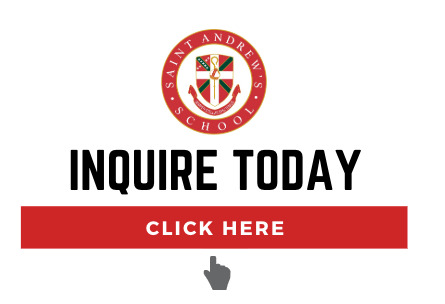 Saint Andrew’s is an IB World School, which means that the school employs a unique academic rigor in the Lower, Middle, and Upper School divisions. The IB style of learning emphasizes students’ personal development and aims to foster inquiring, knowledgeable, and caring young people who are motivated to succeed. The International Baccalaureate (IB) Middle Years Program (MYP) at Saint Andrew’s School is a learning model designed to bring out the very best achievement for Middle School students. The Middle Years Programme, MYP for short, may be complex for some to understand and different from the way parents might have learned when they were in school. In order to best understand MYP and its impact in classrooms, let’s take a moment to compare MYP to something all can relate to - eating and cooking. So many of us love to go out to eat and enjoy great food with families and friends. Many foodies then take this love and expand it into learning to cook. To help understand the MYP way of learning, travel to a favorite restaurant and imagine this: The head chef at the restaurant is offering to email customers recipes of best-loved dishes. What an opportunity! Now there's no need to eat out - the meals can be made right at home! For anyone interested in honing their cooking skills, this might be tempting. But this would not be the MYP way of learning to cook. Now step inside the kitchen, and try on the apron that says MYP. Imagine, instead of just reading the recipe, the opportunity awaits to actually be behind the stove in that favorite restaurant. Think about being able to ask questions as the master chef chops and sautés. See the steps in action, taste each individual ingredient, and discover how flavors work together to make that mouth-watering masterpiece! What does this cooking experience have to do with MYP? Stepping into the kitchen is the MYP way of learning to cook. Being next to the chef to ask questions as they chop, dice, fillet, and fry is the more exciting way of learning - the MYP way - and much better than merely deciphering the lines of an unfamiliar recipe. In this tasty MYP-style learning scenario, the student is driven by interest and curiosity to ask questions which guide an exploration of cooking and cuisine. Questions like: Why does this dish taste so excellent? What flavors are working together? Which flavors are designed to stand out? What type of ingredients are needed to make the dish work? What are the cultural origins of this dish? How has it evolved over time? These questions make the process of learning more interesting and engaging, rather than having the directions dictated plainly by a teacher. Expert teachers at Saint Andrew’s know that this type of learning is what MYP is all about. It is called inquiry-based learning. Scots teachers know that the best learning happens when students are invited “into the kitchen” to ask great questions. Saint Andrew’s Middle School teachers are truly expert chefs at combining the key ingredients needed to form MYP-style learning in their classrooms. Mix a cup of interest, a tablespoon of background knowledge, with a pound of questions and see the MYP soufflé rise. Just ask Stacy O’Connell, grade 8 science teacher. “In the past, I might have started studies about the scientific method with a demonstration or a model. Now using MYP, the students and I begin with questions about what compels and inspires scientists to make discoveries,” said Mrs. O’Connell. “Really, what it comes down to is that scientists, like all of us, are trying to solve problems in the world, by gathering evidence about similarities and differences in nature,” she said. Señora Pin-Mariotto, grade 7 Spanish teacher, is also an MYP expert. “I could begin a unit explaining and showing the ways that communities shape individual identities through culture, but instead, I ask students questions,” she said. Questions she asks include: What makes a community unique? How do natural and human landscapes and resources in the community affect why we do things? What is it about South Florida that attracts Spanish-speaking tourists? Grade 6 teachers and students are also guided by MYP inquiry-based learning. In World Cultures class, a straightforward study of the Wonders of the World doesn’t hinge merely on where landmarks can be found around the globe. “The question students use to guide their learning is how world wonders can be instruments for us to understand modern culture, society, and ourselves,” said Michelle Blum, World Cultures teacher. “And in doing so, students know and care about why it is important to understand world wonders,” she said. This MYP style of learning recognizes that all learners, like all food lovers, go into learning with ideas, interest, and questions. “MYP learning is valuable because it leads to the most substantial and enduring type of education, one that Saint Andrew’s Middle School is proud of,” said Victor Rivera, MYP Coordinator. Mrs. O’Connell could just give students the scientific method to learn. Señora Pin-Mariotto could direct students to read and listen to Spanish words and phrases related to community life. And Ms. Blum could have provided students with a list of World Wonders to memorize. “But that’s not the MYP way,” said Rivera. That’s simply giving out the recipe without letting students try on the apron.